The Israeli building program known as E1 (East-1), situated between Jerusalem and Maale Adumim, has been on the Israeli and world agenda for twenty years. It is subject to a severe Israeli-Palestinian dispute and prompts strong international opposition. As a result, it has yet to be implemented. On November 30, 2012, after long years in which Israel had almost completely frozen the program, a scaled-down forum of nine ministers of the Israeli government met and decided to renew the planning, approval, and construction processes in the E1 area. This decision was part of Israel’s reaction to the UN General Assembly resolution on recognizing the State of Palestine as an observer state that is not a full member of the United Nations. At the beginning of January 2013, a group of Palestinians, with the backing of the Palestinian Authority, set up a protest encampment in E1. Israel waited a few days and then, with Supreme Court approval, evacuated it. The Israeli government and Prime Minister Benjamin Netanyahu rejected the criticism over the decision to build in E1. The Prime Minister’s Office affirmed that Israel would “continue to act in accordance with the vital interests of the State of Israel even in the face of international pressures, and there will be no change in the decision that has been taken.” Israel’s decision was also taken in light of the fact that, according to every past Israeli government, Maale Adumim must be retained by Israel, and the Palestinians have agreed to this in past negotiations. Therefore, the connection of Maale Adumim to Jerusalem needs to be addressed when planning the future of the area. At the beginning of December 2012, the Supreme Planning Council for Judea and Samaria, part of the Civil Administration, began to implement the government’s decision. It decided to deposit the construction plans for two of the E1 residential neighborhoods for public approval, a significant stage in the succession of approvals that still await the plan. At the last minute, however, an order by the Prime Minister’s Office put a halt to this procedure, and so far the plan has not been deposited for public approval. This study discusses the E1 plan, its great importance for the State of Israel, and its vicissitudes over the years. It refutes the claim that the plan would hinder the two-state solution, or prevent linkage between the populations of the northern and southern West Bank. It describes the longstanding consensus in Israel about the future of Maale Adumim and the vital link between Jerusalem and Maale Adumim, of which the E1 plan is an integral aspect; the place of the Adumim bloc in the concept of metropolitan Jerusalem; and the place of that concept in Israel’s approach to security and settlement. The study also explains why avoiding building in E1 is dangerous to Israel’s interests, and likely to result in Maale Adumim and Jerusalem being severed from each other. At the same time, the report strongly criticizes the Israeli authorities’ failure over the years to eradicate the phenomenon of illegal Palestinian building in the area between Maale Adumim and Jerusalem. While this stems from concern for the reaction of the international community, it is gradually constricting Israel’s options in an area so vital for its future integrity. As the study shows, the E1 area is located in Area C, the portion of the West Bank in which Israel has the powers of zoning and planning according to the Oslo II Interim Agreement. In the last year, the Palestinian Authority has nonetheless undertaken development projects in Area C, some with EU financing. Thus the situation on the ground is not static, and Israel will have to find a way to protect its vital interests, especially in this sensitive area, to the east of its capital. The site for the E1 building plan extends over an area of about 12,000 dunams,3 most of it state land, northward and westward of the Jerusalem-Maale Adumim road. Through this plan, Israel wants to link Maale Adumim – a city established east of Jerusalem about thirty years ago, in which about 40,000 people now live – with the ridge of Mount Scopus within Jerusalem’s municipal jurisdiction. So far, owing to the opposition of the Palestinians and the international community, the plan has not been implemented. Three residential neighborhoods, as well as an area for commerce, industry, and hotels, are envisaged for E1. So far only two residential neighborhoods totaling 3,500 housing units have been planned. An additional residential neighborhood, the northern one, and the commercial-industrial zone, which is supposed to link E1 to Jerusalem, are frozen for planning and legal reasons unconnected to the political controversy over the program. A police station and a network of roads and infrastructure have, however, already been built in E1. The plan is, of course, embroiled in an intense international dispute centering on the position of the Palestinians, who seek to prevent what they call the bisection of the West Bank – which, they claim, would torpedo the option of a Palestinian state and preclude a sovereign and urban continuity between the northern and the southern West Bank. The United States backs the Palestinian position and acts to prevent Israel from building at the site, so long as a permanent settlement has not materialized. The Palestinians oppose both the plan and the solution that Israel proposes for ensuring transportation continuity between the northern and southern West Bank. The solution Israel is offering the Palestinians is the use of what is effectively a bypass road (the literal Hebrew term is “fabric-of-life road”). This road would pass between Maale Adumim to the east and Jerusalem to the west, allowing the Palestinians free movement from the Ramallah area to the Bethlehem area. In the area between Maale Adumim and Jerusalem, along the Jerusalem-Jericho road and in the E1 area, a considerable amount of illegal Palestinian building is in progress. This illegal activity has already significantly narrowed the corridor along which the central arterial road between Jerusalem and Maale Adumim runs – from two kilometers to one kilometer. The illegal building already threatens to sever and, in the future, preclude Israeli continuity between the two cities. Under the Oslo Agreements, zoning and planning in these areas (Area C) is under the jurisdiction of Israel. Thus, Palestinian construction without any building permit along a main Israeli artery of this sort is a violation of the signed bilateral agreement and is thus illegal. Israeli avoidance of creating settlement continuity between the Jerusalem area and the Maale Adumim area will inevitably give rise to another, competing, Palestinian continuity running north to south. Even today Israel has great difficulty counteracting such continuity because of the international community’s stance, which opposes any measures against the extensive illegal building in the area. One practical manifestation of the Israeli weakness is the lack of resolve of the State Attorney’s Office and the Civil Administration in the face of this illegal building. This, among other things, is clearly evident in reports of the Civil Administration Central Supervisory Unit. The bypass road will have two lanes. First, there is a lane for vehicles that have come out of the Israeli security envelope and, therefore, there is no concern that they could pose a security risk. Second, there is a lane for traffic coming out of the Palestinian security envelope, which Israel cannot be certain about from the standpoint of security. This separation of traffic into two lanes is not based on religious, ethnic, or national distinctions since Palestinian Arab residents of Jerusalem and Israeli Arabs will be expected to use the lanes for Israeli traffic. Where the traffic from both security systems mixed together on one road, the Palestinian vehicles would have to undergo time-consuming security checks at roadblocks. The bypass road is thus designed to allow for rapid north-south movement in the West Bank with no interference from Israeli security authorities. The Palestinian opposition to the bypass road is based on the claim that having only a transportation link between the northern and southern West Bank is unsatisfactory. This is an unreasonable argument because it ignores the reality that emerged in the wake of the Oslo accords. As part of this reality, the roads in the West Bank became essential arteries for both the Palestinian and Jewish populations, with a dual use: for common transportation, and to create separation and prevent friction between the communities. In the framework of the Oslo accords, representatives of the PA agreed to the creation of the “safe passage” between Gaza and the West Bank. This was to be a wide road serving as a land link from the West Bank to Gaza, and a substitute for territorial continuity. The Palestinians and the Israelis compromised on the “safe passage” issue, each conceding a principle: the Palestinians gave up contiguity between the West Bank and Gaza, while Israel agreed to the creation of a passage with some attributes of foreign land within its own territory. Despite what the Palestinians claim, the building in E1 that has been approved so far, and has not even begun, does not interrupt any existing Palestinian continuity of construction. Israel cannot allow Maale Adumim to become like Mount Scopus in the 1948-1967 period, when the mount was an isolated Israeli enclave under UN custody with only a road connecting to it. Israel cannot allow a situation to emerge of security and urban discontinuity between Jerusalem and Maale Adumim, or the reversion of Jerusalem to a border-town status (as was the case before the Six-Day War) that would preclude the city’s eastward development. The area of Maale Adumim, including E1, is part of the strategic depth that Israel requires in the context of defensible borders – again, in the face of an eastern front, and to make it possible to defend its capital, Jerusalem. The area of settlement around Jerusalem, including Maale Adumim, constitutes part of the metropolitan area of Jerusalem. This area incorporates both settlement and security as two vital, complementary components of the Israeli national interest. There is an almost complete Israeli consensus on the need to link Maale Adumim to Jerusalem via construction in E1, and on the need to retain this territory under Israeli sovereignty within the country’s permanent borders. Six prime ministers, from Rabin to Netanyahu, declared publicly that they would build in E1. Yet, except for the construction of the Judea-Samaria District police station, the process has not even begun because of the international community’s opposition. Time after time, Israeli leaders proclaim their commitment to Maale Adumim and the building of E1. These same leaders, however, show great deference to the position of the United States, which currently seeks to prevent construction in this area. This behavior entails a built-in contradiction: on the one hand, the message is conveyed that Israel will build in E1 because it is so vital to its interests; on the other, through nonpublic diplomatic channels, world leaders receive another message – that meanwhile Israel will bow to the international community’s opposition to this construction. This behavior makes it very difficult for those involved in Israeli public advocacy to address the world’s and the Palestinians’ objections to the E1 plan. Immediately after 1967, aiming to reinforce the status of united Jerusalem as Israel’s capital, Israel built a series of neighborhoods and satellite towns in the environs of the city. The purpose was both security and settlement. The State of Israel and the Zionist movement have always posited a link between settlement and security. From David Ben-Gurion to the present day, the country’s leaders have believed that settlements established in the area of Israel’s security borders would ensure those very borders. To maintain security borders that would enable the defense of Jerusalem and of the country as a whole, a line of fortifications, or weaponry, or strategic depth in themselves would not suffice; it was necessary to settle these areas, thereby anchoring Israel’s security presence in a permanent civilian presence. Jerusalem was united and expanded. Israeli sovereignty was applied to areas north, south, and east of the old jurisdictional borders (comprising about 70,000 dunams). In these areas (which the world has been calling “east Jerusalem” for years), a string of Jewish neighborhoods were set up that currently number about 200,000 residents. Along the new borders of Jerusalem, or in what is called metropolitan Jerusalem, Israel built an additional series of towns and settlements. Decisions by the government and by governmental committees, along with various experts’ committees, referred to this outer circle as “metropolitan Jerusalem.”6 That term drew its formal validity from the many interactions, in various areas of life, between Jerusalem and the surrounding area (the “Jerusalem environs”). With the change in political conditions, the escalating waves of Palestinian terror at the start of the 2000s (in what came to be called the Second Intifada), the worsening of security, and the building of the security fence around many parts of Jerusalem (aimed at obstructing suicide bombers and weapons smuggling), tight security restrictions were imposed on the Palestinian population’s freedom of movement within the metropolis. As a result, the links and interactions between the city and the surrounding area were weakened in the Arab sector. For the Jewish sector, whose freedom of movement was not restricted, the strong links and interactions between Jerusalem and the surrounding settlements were maintained in various domains such as transportation, employment, society, and family. Those linkages, and the perception of Jerusalem as the heart of a metropolis, were a new development. Up to 1967, Jewish Jerusalem had functioned as a border town, hampered and constricted in the economic, commercial, and social areas of life. In almost every regard, functionally speaking, the city in those years was confined to a narrow corridor extending to the west, hemmed in by political borders on its three other sides. Added to all this was the security distress of a divided city threatened by terrorism and the Jordanian army. After the war, of course, the situation changed completely. Israel acted out of intense fear that if it did not quickly settle the area surrounding the city, Jerusalem would once again revert to border-town status in the future. Hence, the country embarked on extensive settlement activity. The western settlement bloc (almost all within the Green Line), which includes Mevasseret Zion, Har Adar, Beit Zayit, Motza Illit, Even Sapir, Ora, and Aminadav, totaling about 40,000 people. The southern settlement bloc (mostly over the Green Line), which includes the settlements of the Gush Etzion Regional Council, Efrat, Betar Illit, Mevo Betar, and Tzur Hadassah, totaling about 80,000 people. The northern settlement bloc (over the Green Line), which includes Givat Zeev, Givon HaHadasha, and Beit Horon, totaling over 16,000 people. The eastern settlement bloc (over the Green Line) – relevant to our concerns here – which includes the city of Maale Adumim and the area of the E1 plan. This bloc comprises about ten communities and totals about 65,000 people. Map of 1995 Oslo II Interim Agreement showing eastern approaches to Jerusalem. Areas marked in yellow are “Area B” where the Palestinian Authority has full civilian jurisdiction including zoning and planning authority. White areas in the West Bank are “Area C” where Israel has full security responsibility and civilian authority over zoning and planning. The main connection between Jerusalem and Maale Adumim must clearly run north of Abu Dis and Azariya, which is precisely where E1 is located. Unfortunately, the Palestinians have been building illegally in Area C close to the main road connecting Jerusalem and Maale Adumim, thereby narrowing the corridor between them. If Israel fails to build in E1, the area will be taken over by Palestinian construction. Former prime minister Yitzhak Rabin said that forgoing the construction of E1 would mean severing Maale Adumim from Jerusalem and probably changing Maale Adumim into what Mount Scopus was from 1948 to 1967. In those years Mount Scopus was an Israeli enclave in the heart of an Arab area. Only a narrow road provided access to it, and Israel was dependent on the mercies of the Jordanian regime and the United Nations to preserve even such a minimal connection. Rabin expressed apprehension that if Israel were to fail to link Jerusalem to Maale Adumim with a continuity of Jewish settlement, the latter city would indeed experience the same fate as Mount Scopus.10 Rabin was the first Israeli prime minister to promote the E1 plan, aimed at creating that very continuity. In essence, Biran outlined a minimal version of the “defensible borders” doctrine, which is a necessary condition for Israel’s security. A slightly more developed version was presented later by Gen. Yaakov Amidror, formerly head of the Research and Assessment Division of IDF Military Intelligence and currently Israel’s national security adviser.12 He, too, specified the area between Jerusalem and Maale Adumim as vital to defending the country. Between the border that is outlined in the agreement and the border that is not outlined in the agreement, Israeli Jerusalem and most of the Jewish satellite settlements that surround the city (Maale Adumim, Givat Zeev, and smaller community settlements) will be situated. The course of the borderline must ensure quantities of land for the continued growth of the Jewish population in the areas of metropolitan Jerusalem….The borderline must be capable of withstanding changing situations of security tensions, and must enable, to the extent that is required, control, impenetrability, and/ or separation between the populations….The borderline of Jerusalem will include within it, as much as possible, areas that topographically control Jewish neighborhoods….The borderline of Jerusalem will ensure the physical continuity of Jewish neighborhoods. The recommendations adopted by the political echelon also stated: “One must enable the Palestinian population to maintain a continuous transportation connection between Bethlehem and Ramallah outside the borders of Jerusalem. According to need, use should be made of bridges or tunnels without transferring ownership of the land above the tunnels or under the bridges.”This recommendation is of great importance; it touches directly on the claim that the E1 plan interrupts Palestinian continuity between the northern and southern West Bank, a subjected addressed at length below. Israel’s need for strategic depth as a component of defensible borders is endorsed today by most Israeli military and security professionals. This strategic depth must include sufficient combat space to deploy defensive forces that will be able to maneuver within it, a reserve force capable of mounting a counterattack if needed, and sufficient distance from the strategic home front. The area between Maale Adumim and Jerusalem, along with the area to the east in the direction of the Dead Sea, is essential to providing Israel with strategic depth in case of the reemergence of threats to the east. In a time of regional instability marked by regime changes, but also in quieter periods, it is forbidden to dismiss the possibility of an eastern front that threatens Israel again taking shape. Hence, the strategic depth provided by the area from Jerusalem through Maale Adumim to the Dead Sea must be regarded as vital for defending the borders of the State of Israel. Control of the access roads to the city must remain in Israel’s hands. Maale Adumim was established by a decision of the Israeli government in 1977. The cornerstone-laying ceremony for the first residential quarters was held two years later, and three years after that, in 1982, the first residents entered the new neighborhoods. In 1991, the state recognized Maale Adumim as a city, the first Israeli settlement in the West Bank to attain such status since Jewish construction there was renewed in the wake of the Six-Day War. Today Maale Adumim numbers about 40,000 residents. A revision of the city’s master plan carried out in recent years updated its aims. The new population target for the city is 103,000 residents, compared to the previous target of 70,000. At the same time, because of political constraints and the resulting decrease in construction, the city’s rate of growth in recent years has been very modest. Instead of about 500 housing units per year, in recent years no more than a few dozen new units have been built annually. Maale Adumim is located on about seven square kilometers east of Jerusalem on the Jerusalem-Jericho road, close to the northern Jerusalem neighborhoods of Pisgat Zeev, French Hill, and Ramat Eshkol. The city’s buildings extend to the Judean Desert, 450 meters above sea level. Despite being situated at the edge of the desert, the city and its buildings do not have a desert-like nature. Instead, there are broad boulevards, squares, and numerous wide open public areas. Buildings are constructed in the stone-faced Jerusalem style. Maale Adumim’s dependence on Jerusalem for employment, commerce, culture, and education, and the lack of a significant urban center in the city, make Maale Adumim in many regards a suburb of Jerusalem. Between Maale Adumim and Jerusalem lie a number of Arab villages: Abu Dis, Azariya, A-Zaim, and Isawiya. The road that connects Jerusalem and Maale Adumim is Highway 1, which ends at the entrance to Maale Adumim. Access to Highway 1 from Jerusalem is in the French Hill area and also via the newer Mount Scopus road. Using that road, one can get from Jerusalem to Maale Adumim in about five minutes. Despite their physical separation, the two cities’ geographic proximity makes them mutually visible. Maale Adumim can be seen clearly from Mount Scopus and the Mount of Olives. From Maale Adumim one can see Jerusalem with the three towers that adorn its skyline: the Hebrew University tower, the Augusta Victoria tower, and the tower of the church in A-Tur. As noted, Maale Adumim does not provide all the public services that its residents need. There is no hospital in the city. Cultural amenities are relatively limited, and most of the public transportation from Maale Adumim goes to Jerusalem. Hence, Maale Adumim’s residents are to a large extent reliant on Jerusalem, which also contains many of the government offices that residents sometimes need. In addition, 80 percent of the city’s manpower is employed in Jerusalem. There are, however, also a number of ways in which Maale Adumim serves or will serve the residents of Jerusalem. Among these are the Mishor Adumim industrial zone, where thousands are employed. The garbage dump for metropolitan Jerusalem is also located within Maale Adumim’s jurisdiction and is under its responsibility. This dump is now being shut down. The long-term plan for the area is to establish a center for service, employment, and business in the E1 area that will serve both Jerusalem and Maale Adumim residents. 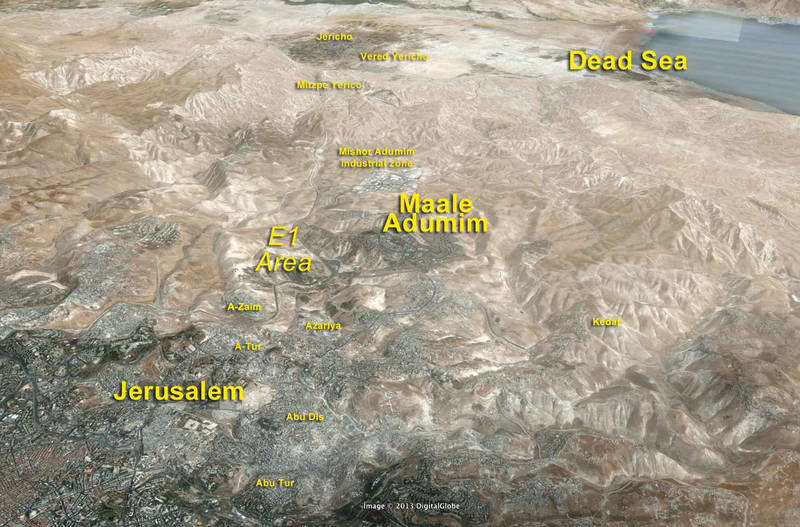 Maale Adumim’s jurisdiction extends over about 65,000 dunams. These include residential areas, afforestation areas, an industrial zone, leisure areas, and other locations. Much of the territory within the Maale Adumim master plan cannot be used for residential building. Some of this territory is used for IDF firing ranges; other parts are intended for roads and other public services. Eighty-three percent of the residents are native Israelis; 81 percent are secular and traditional and 18 percent are religious. Some 8,300 children attend the city’s schools, and 2,000 are in its nursery schools and kindergartens. There are 9,000 residential units in the city. In January 1994, the Settlement Subcommittee of the Supreme Planning Council for Judea and Samaria issued a new plan that widened the previous Maale Adumim master plan. This plan constituted the basis for the future E1 plan, and then-prime minister Rabin ordered his housing minister, Benjamin Ben-Eliezer, to begin planning a neighborhood to be situated in E1. Since then the planning procedures for the E1 neighborhood have advanced very slowly due to international and Palestinian opposition. The E1 area extends over the hills between Maale Adumim and Jerusalem, which dominate the main roads in the area.17 E1 includes areas north of Highway 1 (the Jerusalem-Jericho road) and a small piece of land south of it. The boundaries of E1 (in the area designated for industry and commerce) verge on those of municipal Jerusalem. To the southeast, E1 is bordered by Highway 1, Azariya, Abu Dis, and lands of the Jahalin Bedouin tribe. To the west it is bordered by Issawiya, the eastern slopes of Mount Scopus, A-Zaim, and Anata. The northern boundary is Road 437 in the area of the Hizme checkpoint. View of the E1 area and Maale Adumim (on right) as seen from Jerusalem (Mount Scopus). The E1 residential quarter (east), which was approved, designates an area of 1,271 dunams for a residential neighborhood with 2,182 apartments. Also planned in this framework are a commercial center, gardens and parks, a school, a community center, synagogues, a mikveh (ritual bath), and a public institution. The intention is to implement this plan in two stages of 967 apartments and 1,215 apartments. The E1 residential quarter (south), which was approved, designates an area of 829 dunams for a residential neighborhood with 1,250 apartments. Also planned in this framework are an elementary school, kindergartens, day care centers, synagogues, a mikveh, parks, and public gardens. The E1 residential quarter (north), comprising an area designated for the construction of about 1,500 homes of the “build your own home” type. This plan has not advanced because the topography in the area is extremely difficult, and connecting the area to the existing and planned road networks is also difficult. These three residential neighborhoods would extend to the north of Maale Adumim and north of Highway 1. They would not interrupt any existing continuity of Palestinian construction, despite reports to the contrary. A Metropolitan Center for Work and Business will encompass 1,345 dunams for joint activity between Jerusalem and Maale Adumim in the economic realm. The plan for this center, which was submitted by the Ministry of Industry and Trade, was approved in 2002 and all its building permits are in force. The center is intended to provide employment to both Palestinians and Israelis. This project has, in effect, been suspended after a reassessment of the cost of the land. It turned out that many of its sections are privately owned by Palestinians. Hence the project is viewed, at least at this stage, as impractical. If, in the future, a way is found to implement it, this part of the plan will make it possible to link the jurisdictional areas of Jerusalem and Maale Adumim. That linkage, if and when it is created, also will in no way interrupt any existing continuity of Palestinian building. Indeed, the opposite is closer to the truth: southwest of the area of the proposed Metropolitan Center – which for now is frozen – the Palestinians have been trying for years to create a continuity of building and to link Anata to the north with A-Zaim to the south. Such a continuity, if created, will leave Maale Adumim as an enclave behind an unbroken string of Palestinian settlements, and Maale Adumim will remain connected to Jerusalem only by a road. Recently, the area on the eastern slopes of Mount Scopus, which the two Arab settlements seek to reach and link up with, was declared a national park where all building is prohibited, whether by Jews or Arabs. The area of the national park, which in earlier plans was marked as a green area, comprises about 700 dunams. The area, which is of high scenic value, constitutes the eastern entrance to Jerusalem. It contains about 80 antiquities sites, caves, cisterns, churches, and burial sites from the Second Temple and Byzantine periods, along with an attractive landscape that features habitats for desert and Mediterranean flora, as well as about 40 different species of birds.18 Apart from all that, the planners do not conceal the fact that its designation as a construction-free national park will prevent a linkup between Anata and A-Zaim, which would entail severing Maale Adumim from Jerusalem. The Headquarters of the Judea and Samaria District Police was relocated to the E1 area in 2006 on a tract of 179 dunams designated for this purpose. Around the headquarters an extensive network of roads and water and electricity infrastructure was prepared, which are to serve the residential neighborhoods along with other future uses in the context of the E1 plan. However, the sewage infrastructure has not yet been built. Every few weeks a large truck arrives to empty the large septic tank that serves the E1 police station. Over 50 percent of the E1 lands are defined and planned as green areas. Maale Adumim (right) and the Israel Police station (left) in the E1 area. E1 is meant to connect Maale Adumim to Jerusalem. The main charge of the Palestinians and the international community against Israeli building in E1 is that it will prevent the state of Palestinian from having territorial continuity and a link between the northern and the southern West Bank, thereby thwarting any attempt to arrive at a permanent settlement. Israel is offering a feasible solution to the problem in the form of a bypass road, which is already partially paved. The route of the completed road will run from north to south, between Jerusalem and the Adumim Bloc, linking the northern West Bank to the southern part as an alternative to other existing roads. The Palestinians reject this solution. A completed section of the Palestinian bypass road. Its final completion will enable transportation continuity between the northern and southern West Bank, similar to other existing “fabric of life” roads built for the Palestinians. In September 2007, Israel expropriated 1,408 dunams of the lands of Abu Dis, A-Sawahra a-Sarkia, Nebi Musa, and Khan al-Ahmar for the purpose of paving the bypass road to connect Ramallah to Bethlehem.19 The section of the road from Hizme to the A-Zaim checkpoint has already been paved, at a cost to Israel of close to NIS 300 million, passing through a tunnel under the Jerusalem-Maale Adumim road. Thus the Palestinians can have transportation continuity without breaking Israel’s link between Maale Adumim and Jerusalem. The road has yet to be completed due to budgetary constraints and opposition by the United States and the Palestinians. The Palestinians fear that paving the road will vitiate their claim about the severance of the northern and southern West Bank, which is at the heart of their campaign against Israeli building in E1. Part of the already-existing bypass road is divided by a wall in the middle, separating Israeli and Palestinian traffic. a different, competing, Palestinian continuity running north to south. The Palestinian opposition to the bypass road, based on the contention that they cannot settle only for a transportation link between the northern and southern West Bank, ignores the reality that has emerged since the Oslo accords. In this reality, the roads in the West Bank became important arteries for both the Palestinians and the Israelis, with a dual use. In addition to ordinary transportation use, the roads create separation between the communities and prevent friction between them. In recent years, this has led to the creation of a number of roads that are either for Israeli or Palestinian traffic only. Palestinian communities that supposedly are severed from each other by the presence of Israeli communities are in fact linked by such roads, even if traffic is sometimes restricted for security reasons. Likewise, Jewish communities that seemingly are cut off from each other by existing Palestinian communities are, in fact, connected by roads. Even if this reality is not always convenient for the two sides, they accept it as an existing fact of life. Linkages of this kind exist, for example, between Jewish communities such as Avnei Hefetz, Einav, and Kedumim; between Kedumim and Yitzhar; from Maale Ephraim and the Jordan Valley to the Tapuach Junction and Ariel; between Ateret, Ofra and Shiloh; between Tekoa and Efrat; between Telem and Adora; and between Gush Etzion and Kiryat Arba. The connection from Jerusalem south to Gush Etzion also passes through the “tunnel road,” part of which has become a transportation corridor through Palestinian communities. After the Oslo accords, numerous bypass roads were paved for the Jewish population. These circumvent Palestinian population concentrations and enable safer movement for Jews, even if, not infrequently, travel time has been lengthened. Traffic between Palestinian communities and hubs of life and work are subject to security restrictions because of past acts of terror. It will be possible to ameliorate this situation in the future when the security situation permits doing so. In any case, there is separate Palestinian traffic, for example, on the underpass road between Bidu and el-Jib in the Givat Zeev area. Road 443 between Jerusalem and Modiin, which mostly serves the Jewish population, is crossed by passageways that serve Palestinians only. The old Road 60, running north-south along the central mountain ridge from the Wadi Harima area southward to the Beit El and Ramallah areas, currently serves Palestinians only. The section of old Road 60 from Karmei Tzur in the direction of Halhoul also serves Palestinians only, as does the road eastward from Ofra through Taibe in the direction of Kochav Hashachar and Rimonim, and the passage through Beitin (between Ofra and Beit El). Nor, today, are Jews allowed to travel on the old Jerusalem-Hebron road that passes Solomon’s Pools and Deheishe; only Palestinians may use it. It is important to emphasize that these separate roads are currently operating and are not “apartheid” roads. Rather, they provide direct and convenient transportation links that enable both Israelis and Palestinians to reach their desired destinations without having to unnecessarily pass through areas that would complicate and lengthen their travel time. an inseparable part of the security-fence project and are intended mainly to replace roads whose access has been severed or disrupted by the building of the fence. These roads are paved by the defense establishment for the Palestinian population and their purpose is to allow the Palestinian residents, whose flow of movement and “fabric of life” linkages have been compromised, movement that is as continuous as possible, and convenient linkage between their communities and the main towns in the area. A ruling by the Supreme Court recognized the great importance of the “fabric of life” roads as an important and inseparable component of the building of the security fence. A similar concept is embodied by the planned bypass road linking the northern and southern West Bank – the road whose completion the Palestinians now oppose. The bypass road that is planned to enable Palestinian traffic from north to south is not fundamentally different from the safe passage route between the West Bank and Gaza. These two areas of Palestinian settlement, which are relatively distant from each other, would be linked only by a road rather than have territorial continuity. On the safe passage between Gaza and the West Bank, the Palestinians and the Israelis compromised. The Palestinians gave up land continuity and settlement continuity between Gaza and the West Bank; the Israelis agreed to the creation of a passage that in some ways turned some of its territory into an ex-territory. A similar understanding could be reached regarding the link between the northern and the southern West Bank. The nature of the road, and the traffic arrangements on it, could be decided through negotiations. By delaying its implementation of the decision to build E1, Israel incurs a double cost. First, the linking of Jerusalem and Maale Adumim, to ensure that this strategic area will remain part of Israel, is yet to be achieved. After years in which a consensus prevailed on keeping this an Israeli territory in the context of the permanent settlement, the delay erodes this national consensus. Second, Palestinian and Bedouin settlement is encroaching on this space all the time, the great majority of it illegal: that is, this Palestinian construction is executed without any building permit. According to the Oslo II Interim Agreement, the territory between Jerusalem and Maale Adumim has been designated as Area C, meaning that the powers of zoning and planning were retained here by Israel. Illegal Palestinian construction enables the takeover of vitally important land, some of it within the E1 area. The West Bank town of A-Zaim (at bottom) and the Jerusalem neighborhood of A-Tur (at top) taken in 1989 (left) and in 2012 (right). The photos illustrate how the expansion of Palestinian construction over the years has constricted the area around the Jerusalem-Maale Adumim highway, effectively constricting the corridor connecting these two Israeli cities. This is precisely the challenge Israel faces all along this route including in the area of E-1. Israel has refrained from tackling this phenomenon, particularly because of international pressure and activity by leftist movements that provide support to this illegal settlement activity. Even Israel’s attempt to fulfill the letter of the law and settle the illegal interlopers, after evacuations, within permanent and legal settlement sites – such as the one set up at the end of the 1990s on the outskirts of Abu Dis – has not gone well. More recently, the Bedouins of the Jahalin tribe – who are under the sway of the Palestinian Authority and European organizations – rejected two further Israeli offers to create two additional permanent sites for their settlement, one south of Jericho and the other north of it (most of the Jahalin live in Jericho). Israel built this permanent community for Bedouin on the outskirts of Abu Dis. Some sold their apartments and returned to illegal construction sites in the Adumim area. The Palestinians’ invasion and illegal construction begins within municipal Jerusalem north of Highway 1 at a site called Sha’ar Mizrach. This is mostly Jewish-owned territory occupying about 180 dunams in the Anata area. Although this tract of land has potential for linking Jerusalem to E1, currently the state is not allowing the land’s owners to exercise their ownership and also is not taking action against the illegal Palestinian building there. A visit to the police station in the heart of E1, looking westward, reveals a further concentration of illegal Palestinian building, widely dispersed on rocky land. There are a hundred buildings made of iron, wood, blocks, and cement, with laundry lines hung between them. Some are covered with cloth, apparently for purposes of camouflage. Also visible are horses, goats, a water tank, and a mobile restroom. Not far away is a smaller cluster of more improvised and temporary structures made of tin, wood, and iron. Such a “landscape” is typical of many of the dozens of illegal Bedouin-Palestinian outposts in the area. Such concentrations, each having individual structures sometimes numbering in the dozens, can also be found near the sewage purification plant south of Road 437 in E1, and also north of this road, as well as northwest of the Mahane Yishai junction, north of Highway 1. Not all of these concentrations may be characterized as “spontaneous” building. Sometimes the building is supported by European organizations or by elements associated with the Palestinian Authority – and also, according to military sources, by the PA itself. Not infrequently in these clusters of illegal housing, new, cloth-covered structures appear. One also sees large water containers, and restroom structures of a kind not typical of Bedouin communities. Prefab buildings br ought in without permits by Bedouin in the Mishor Adumim area, next to Route 1. A water meter installed by Mekorot, Israel’s national water company, next to an illegal Bedouin construction site near Nahal Og. The areas that are attractive for illegal Palestinian settlement are those along Highway 1. Palestinians from Areas A and B can easily enter and build along this artery. The “magnet” is a spring that never runs dry: the pipeline of Mekorot, the Israeli water corporation. Many hundreds of pirate hookups have already been seen along this pipeline. Whoever travels on the road immediately grasps the situation: there are pick-up points for students and residents at every intersection, tractors that move at slow speed along a major highway, herds of goats crossing the road. The state and the Public Works Authority have invested many millions to build a road of the highest safety standards, a wide highway that connects Jerusalem to the Dead Sea area. Mountains were moved for this purpose; yet if the present process continues, soon this splendid road will wend its way through a large Bedouin village. The state is not dealing with the plague of pirate hookups and theft of water from the Mekorot pipeline; on the contrary, it is passively acquiescing. Recently, Mekorot installed a faucet with a meter, and the PA has been paying for the water that the Bedouins consume. Another notable phenomenon is the Palestinians’ illegally accessing electricity by linking up to the street-lighting poles along the road, which has become widespread. Also helping to entrench the illegal permanent presence of the Bedouin in the area is UNRWA (the United Nations Relief and Works Agency), which provides them with food and winter equipment while tending to their medical needs as if they are refugees. European organizations support the schools the Bedouin have set up and, with help from the PA, supply them with buildings and water containers. Water tanks at an illegal construction site in the Maale Adumim area, supplied by the humanitarian organization ACF and the European Union. The state does not automatically open files on illegal building in the area. Occasionally it does so, and even issues demolition orders for buildings created without permits. The main problem is reluctance to implement these orders. In almost all cases the transgressors, with the help of various organizations, petition the Supreme Court against the Civil Administration, which issues the demolition and work-stoppage orders. The petitions present supposedly factual claims and various legal claims. The petitioners request that the demolition order be canceled, and succeed in delaying its implementation until the court rules on the petition. Because the demolition of a building is an extreme and irreversible step, the court usually accedes to the request. The judges issue an interim order until making a further ruling, and request the state’s response to the petition. This is where the problem begins: the state submits repeated requests to defer the date and thereby drags out the case for years, until the patience of the court registrars runs out. The file is then canceled on grounds of inaction, and the interim order blocking demolition remains in force. Hence, in effect, the demolition orders that the Civil Administration issues are nullified, without serious discussion of the petitioners’ claims. The petitions to the Supreme Court have unfortunately become “part of the statutory process.”The phenomenon emerged and became increasingly common because of the slow, very slow, treatment, to the point of total suspension of activity, by the Supreme Court Division of the Justice Ministry…. The illegally-building Palestinian population was well aware that when submitting a petition to the Supreme Court, the illegal-building file usually goes to the archive and the chances of reviving it are close to zero. The Palestinian population, of course, makes use of this time to complete the construction and to populate it so as to hinder or thwart the demolition. There are hundreds of illegal-building files from recent years that in fact do not receive appropriate treatment, owing to manpower limitations of the Attorney General’s Office and the State Attorney’s Office. The result is that we are forced to remove from the agenda dozens of illegal-building files that prompted a petition to the Supreme Court, despite the fact that a considerable part of them are apparently in areas of importance, which also are defined as such in the priorities (p. 4). The year 2008 was characterized by an almost total freeze of enforcement with regard to the illegal Palestinian building. Freezing the demolitions and other enforcement actions pertaining to infrastructure transmits a negative message to the population and enables the creation of facts that we will have difficulty coping with in the future (p. 1). The State Attorney’s Office, in addressing these claims in the reports of the Civil Administration Central Supervisory Unit, stated that the policy of the Supreme Court Division reflected the general priorities for enforcement in this sphere.22 In other words, there apparently is no reason to pursue the case in court and have the petition rejected when, in any case, the enforcement authorities (that is, the Civil Administration) have no intention to demolish the buildings because of priorities related to a shortage of resources. Yet a further inquiry, based on information obtained through the Freedom of Information Law, revealed that no significant change had occurred in the treatment of the demolition-order cases for illegal structures in the West Bank, in general, and the Maale Adumim area, in particular. According to an inquiry conducted in 2011,24 at that time, in the Supreme Court there were 162 petitions pending that had been submitted by Palestinians beginning in 2008, and on which interim orders had been issued forbidding the Civil Administration to demolish structures built in the West Bank without authorization. In many cases, it turned out, more than ten consecutive requests had been submitted – in some of the cases, sixteen consecutive requests – to defer the date of the state’s response to the petition. In many instances the Supreme Court registrars had issued four or five warnings before cancellation on grounds of inaction, and in some cases seven such warnings had been issued. In these cases no discussion was held on the petition, the state having refrained from submitting its response to the petition and to the interim order. In such cases the interim order remains in force and, in effect, prevents the demolition. The upshot of these cases, like hundreds of others, is the effective cancellation of hundreds of demolition orders against illegal Palestinian building that have been issued in the West Bank, in general, and in the Maale Adumim area, in particular. The State Attorney’s Office is deliberately delaying action on these demolition orders. This behavior may be explained in statements by former Deputy Attorney General Malkiel Blass, written in the name of the attorney general, on April 11, 2009, in response to an earlier petition by the Regavim movement. A possible explanation is that political considerations are preventing the demolition of the illegal structures. Presumably, the root cause is pressure from the international community. In other words, Israel does not have the political latitude to demolish hundreds of illegal structures in the Adumim area and thousands more elsewhere in the West Bank. The Palestinian population is, of course, well aware of this reality, leading to still more illegal construction. Nevertheless, in an event covered extensively in the media,26 when in January 2013 members of the Palestinian “Popular Committees” set up a protest encampment in E1, after the government’s decision to advance the planning processes for construction there, the state acted quickly, with the approval of the Supreme Court, to evacuate the encampment. Over the years this situation, in which Israel has had difficulty coping with extensive illegal building, has reduced the width of the corridor between Jerusalem and Maale Adumim from about two kilometers approximately fifteen years ago to one kilometer and even less at present. This also constricts the possibilities for building in E1 and the adjacent areas. Security officials, who concur with this assessment, warn that if Israel does not take significant steps to stop the Palestinian takeover of these areas, in the future it may be impossible to carry out the E1 plan as envisaged, particularly in the northwestern area that abuts Anata. Security officials believe that some of the Bedouin migration into the E1 area stems from fear of being left outside the route of the separation fence, which is intended to incorporate the Adumim bloc (including E1) into Israeli territory. In past Israeli-Palestinian negotiations, the Israeli team insisted on Israel retaining E1 and the connection between Jerusalem and Maale Adumim. This was also part of the peace proposal made by former Prime Minister Ehud Olmert to Mahmoud Abbas. Israeli Diplomatic Behavior on the E1 Issue: A Dual Message? Along with the frequent declarations of commitment to Maale Adumim and the E1 building plan, all recent prime ministers have acceded to requests by U.S. administrations and agreed to freeze, or to coordinate with the United States, the actual building in E1. Israeli leaders, too, after announcing that the planning processes for E1 would go forward, made clear that the plan had not yet reached the implementation stage. This dual behavior pattern is marked by a built-in contradiction. On the one hand, domestic audiences hear the message that Israel is going to build E1, a location extremely vital to the country’s interests. On the other hand, world leaders receive another message through private diplomatic channels – that Israel will meanwhile heed the position of the international community. This behavior inevitably makes it very difficult for Israel to respond to international and Palestinian protests against the E1 plan. The result on the ground is that the plan is not implemented, and despite the talk of “advancing” it, it has not even approached the implementation stage. Even after the December 2012 decision of the Supreme Planning Council for Judea and Samaria to deposit the plan for public approval (a decision not yet carried out), a long path still lies ahead. Many months must pass until the public-approval process is completed. The council then has to decide whether to accept all of the objections that are raised, reject all of them, or accept some of them. Assuming that the plan passes, the council then has to authorize it. Only then can the Housing Ministry prepare tenders for marketing the land for construction. Publication of the tenders also requires approval by the political echelon. The 2001 Taba talks, then, were the point at which E1 became a red flag for the Palestinians, even though previously they had not opposed it. And they indeed were able to harness the international community to their cause. Nevertheless, the dual message of the Israeli leadership – on the one hand, strong declarations on E1; on the other, delays and deference to the international community – has made it very hard to realize the supreme Israeli interest in building E1. Already in Rabin’s day, Israel had refrained from carrying out the construction plans for the area because of an understanding with the Clinton administration that its fate would be determined in negotiations.38 Netanyahu, in his first term, tried to promote the plan and even initiated a decision to create a joint municipality for Jerusalem and the settlements surrounding it, but this too was stymied by U.S. opposition. Prime Minister Barak also spoke in favor of continuity and linking Jerusalem and Maale Adumim, but he allowed Israel’s negotiating team to discuss the future of this area in the framework of the permanent-settlement negotiations with the Palestinians. It was Sharon’s successor, Ehud Olmert, who gave the United States an explicit undertaking on this matter. In an interview to the Jerusalem Post in September 2005, Olmert publicly confirmed that Israel had promised the U.S. administration it would not build between Maale Adumim and Jerusalem. “The State of Israel made a commitment to freeze construction…therefore, we would be acting irresponsibly if we were to build there.” At the same time, Olmert, too, emphasized that this did not mean the plan had come to an end. He made similar statements to Mayor Kashriel of Maale Adumim in meetings held in recent years. It is necessary to speed up the approval process of the E1 plan immediately with the aim of implementing it, or at least reaching a situation of immediate preparedness to do so. In parallel, a public information campaign must be launched in Israel and abroad that, among other things, will use material from this study, with the aim of countering and mitigating the predictable international onslaught against the promotion and implementation of the plan. Even if the plan is not implemented at this stage, Israel must act immediately against the illegal building in the Maale Adumim-Jerusalem area, while overcoming the obstacles in the Civil Administration, the State Attorney’s Office, and on the political level that so far have prevented effective measures against this phenomenon. The paving of the bypass road should be renewed immediately, so that it can be fully built and made available to the Palestinians. The laying of the road should be accompanied by explanations of why this road constitutes a solution to the “continuity problem” as the Palestinians portray it, citing similar precedents that already exist. The linking of the E1 area to metropolitan Jerusalem can already begin. The building authorizations for the Metropolitan Center for Work and Business have been valid for some time. A joint legal team should be created for the Jerusalem and Maale Adumim municipalities, to be tasked with solving the legal problems that are delaying the work on constructing the Metropolitan Center. In the joint employment area on the seam line between Jerusalem and Maale Adumim, similar to the Barkan industrial zone in Samaria, both Jews and Arabs are to be employed, and this is a point to be emphasized. The international community has been acting with a lack of good faith when it complains that Israel is violating international law just over its announced intention to build in E1, while maintaining silence regarding Palestinian conduct in the area. The international community should be expected to honor signed agreements, and if the Oslo Agreements are still considered to be in force, then the Palestinians are forbidden to build in Area C. The Palestinians, as well, must honor the agreements under whose framework the Palestinian Authority was established, which controls more than 95 percent of the Palestinian population. The dual message that Israel conveys on the E1 issue – we will build the neighborhood vs. we will acquiesce to the world’s position and not build – makes it very difficult to explain the Israeli interest in developing E1. If the plan is so vital, why is it not being implemented despite the international community’s opposition? If the plan can be delayed, then perhaps it is not so vital? If there is indeed an intention to build, the time to act is now; but if the real aim is to keep deferring to international sensitivities, one should state this plainly and at least reap the dividends of doing so. 1. Barak Ravid and Natasha Mozgobia, “The United States Harshly Condemns the Intention to Build in E1,” Ha’aretz website, December 3, 2012 (in Hebrew). 2. “Catherine Ashton: ‘The Building around Jerusalem Is Unprecedented,’” Maariv-nrg website, December 20, 2012. 3. A dunam is equal to one thousand square meters, or roughly one-fourth of an acre. 4. See the video by the Jerusalem Center for Public Affairs, “Indivisible Jerusalem,” http://www.youtube.com/watch?feature=player_embedded&v=98DMPOC-dUQ. 5. Conference on settlement and security with the participation of members of the Settlement Division of the Jewish Agency, security officials, and those involved in the planning of settlements, held at the Jewish Agency at the end of the 1990s. 6. For elaboration on this concept, see the report “Metropolitan Jerusalem: Master Plan and Development,” prepared for the Ministry of Interior, the Ministry of Housing, the Israel Land Administration, and the City of Jerusalem, 1994 (in Hebrew). Research team headed by Shmarya Cohen and Adam Mazor in cooperation with the Jerusalem Institute for Israel Studies. Nadav Shragai, “Jerusalem: The Dangers of Division,” Jerusalem Center for Public Affairs, 2008, pp. 24-25. 7. Maia Hushan et al., “About Your Data,” Jerusalem Institute for Israel Studies, 2012, p. 7 (in Hebrew). 8. The data are based on the book by Aryeh Hess, Jerusalem and Her Daughters, self-published, 2009, pp. 28-30 (in Hebrew). However, the numbers were updated with the help of the database of the Interior Ministry and the relevant local and regional councils, and they are accurate as of the end of 2011. 9. Shragai, “Jerusalem,” pp. 24-25. 10. See, e.g., statement by former Knesset Speaker Reuven Rivlin on words in this spirit by Rabin and past leaders of the Labor Party, on the Megaphone site, article by Zvi Singer, “The Government Unanimously Rejected the UN General Assembly Resolution,” December 2, 2012 (in Hebrew). 11. Yossi Levy, “Gen. Biran: Only Territorial Continuity Surrounding Jerusalem Will Ensure Israeli Control,” Maariv, February 25, 1996, p. 15 (in Hebrew). 12. For elaboration on the issue of defensible borders in general and in the area east of Jerusalem in particular, see “Defensible Borders: A Necessary Condition for Israel’s Security,” Jerusalem Center for Public Affairs, 2005, article by Yaakov Amidror, “Israel’s Requirements for Defensible Borders,” and the appendix: “Military-Strategic Aspects of the Topography of Judea and Samaria for Israel’s Security” (in Hebrew; versions in English also available). 13. Appendix 7 of “Jerusalem: Links and Borders,” prepared by a professional team for the Ministerial Committee for Jerusalem Affairs during the 1980s (in Hebrew). 14. A lecture by Gen. Yaakov Amidror at the Lander Institute in 2007, at a conference on the unity of Jerusalem. 15. The facts presented at the beginning of this section are based on a survey prepared by the engineer of the Maale Adumim municipality, Gadi Brandeis. 16. Regulations Concerning Local Councils (Exchange of Maps) (Maale Adumim), 1991. Cited in Shmuel Berkovitz, The Wars over the Holy Places (Jerusalem: Jerusalem Institute and Hed Arzi, 2000), p. 171 (in Hebrew). 17. Map of the E1 plan. 18. From Protocol of the District Committee of Jerusalem No. 2011005, April 5, 2011 (in Hebrew). 19. Akiva Eldar, “Israel Expropriated Lands of Four Villages in the West Bank,” Ha’aretz, October 9, 2007 (in Hebrew); Aluf Benn, “The United States Demanded Clarifications on Israel’s Intention to Expropriate Palestinian Lands in E1,” Ha’aretz, October 14, 2007 (in Hebrew). 20. See “Paving Alternative Roads for Palestinians,” website of the B’Tselem organization, January 1, 2011 (in Hebrew). 21. Sources in the Civil Administration. 22. Response of the State Attorney’s Office, February 25, 2009, to the director of the Supreme Court Division (in Hebrew). 23. Ruling of Justices Beinisch, Grunis, and Hayut, Supreme Court 9815/09, January 5, 2011 (in Hebrew). 24. Letter by Amir Fisher, attorney for Regavim, to the director of the Supreme Court Division of the Justice Ministry, Attorney Osnat Mandel, December 25, 2011 (in Hebrew). 25. From the response of the State Attorney’s Office, December 18, 2011, to the request of the Regavim movement to participate in Supreme Court Case 9715/07 (in Hebrew). 26. See, e.g., Chaim Levinson, “The Police and the IDF Evacuated within Hours the Palestinian Encampment Set Up in E1,” Ha’aretz, January 14, 2013 (in Hebrew). 27. Husseini said at the time: “The most important Palestinian activity at this time is construction and even without a license.” See Nadav Shragai, “Jerusalem Is Not the Problem but the Solution,” in Moshe Amirav, ed., Mr. Prime Minister: Jerusalem (Carmel and the Floersheimer Institute, 2005) (in Hebrew). 28. A report in the local paper Jerusalem during that period. See also in Hagai Huberman, “The Battle forMevasseret Jerusalem,” Makor Rishon, December 14, 2007 (in Hebrew). 30. Yariv Mohar, “Palestinian-Bedouin Gesture in Appreciation of Human Rights Activists,” Mahlaka Rishona, May 16, 2011, http://www.news1.co.il/Archive/003-D-59703-00.html (in Hebrew). 31. “Fatah: Evacuation of the Outpost at E1 – A Crime,” website of Reshet Bet, Israel Radio, January 13, 2013 (in Hebrew). 33. Protocol, meeting between Peres and Benny Kashriel, January 24, 1996 (in Hebrew). 34. Natan Guttman, “Sharon: We Will Continue the Project to Link Jerusalem to Maale Adumim,” Ha’aretz, April 5, 2005 (in Hebrew). 35. Nadav Shragai, “Mofaz: A Continuity of Settlement between Jerusalem and Maale Adumim,” Ha’aretz, March 3, 2003 (in Hebrew). 37. Ir Amim, position paper, December 2012, p. 4 (in Hebrew). 38. According to a minister in Rabin’s government.